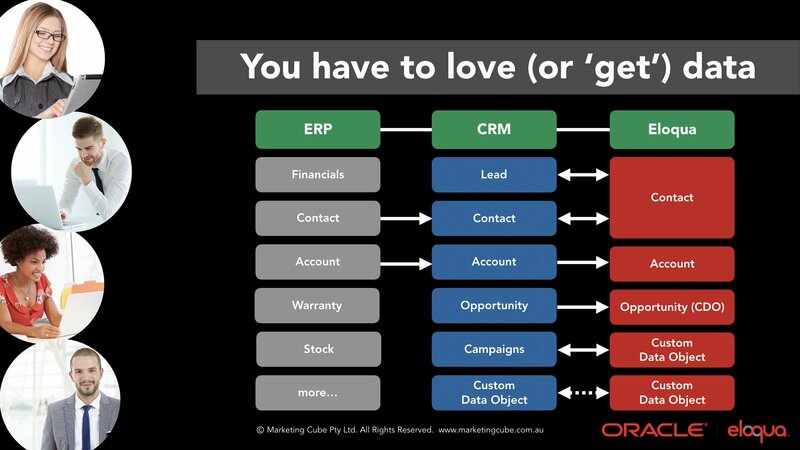 In November we explored the fundamentals of Marketing Automation and how to get more from Eloqua & your CRM data. Over the past few months I’ve had numerous conversations with clients helping them get more from Eloqua. Essentially those discussions lead to campaigns that would take advantage of Eloqua’s powerful automation capability. The November Eloqua User Group had almost 60 people register for either the webinar or the in-person event held in Sydney. Clearly, getting back to the basics and exploring the fundamentals of Marketing Automation resonated. Let’s take a look at the various topics we covered. This list could be debated for hours and most people would probably have an opinion. We created this list based on interactions with our Eloqua customers and the enquires we get through our Support desk. Understanding where you data comes from e.g. the source of truth and the relationship of those various pieces of data to one another, is critical for Modern Marketers. It’s difficult to segment your data unless you understand it’s origin and it’s purpose. When you understand the data and its’ origin, then you can begin to analyse with greater accuracy and also begin to make some assumptions. This process plays into the idea that engaging with your audience if far more desirable than simply spamming them. This is what we mean by understanding the “relationship” of your data. For most Eloqua customers, the CRM is the source of truth. In the diagram above you can see the CRM at the center of the image. The arrows between the various “objects” show the flow of the data. In most cases, the CRM is the source of truth of account or company details. 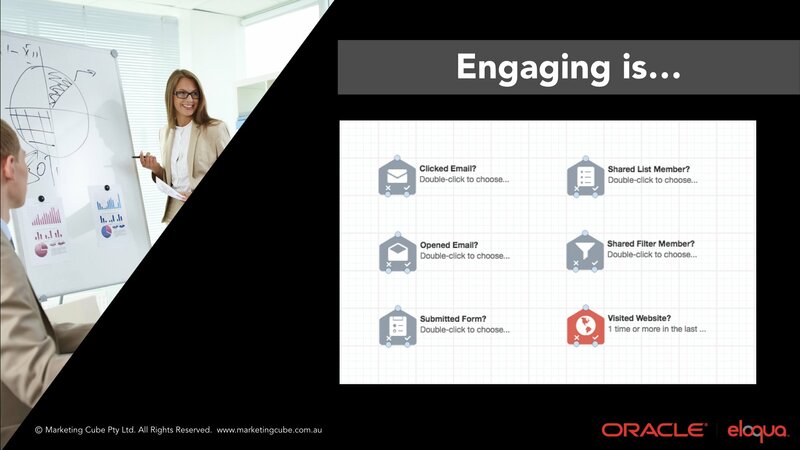 In this example, Eloqua only needs access to account data for the purpose of segmentation and possible personalisation requirements. In the two slides above, you can see two sets of steps. These steps allow you to make “Decisions” based on a person’s behaviour and then “Act“. For example, after sending an email, did the person click through from the email? If yes, you can then move onto a new step or if they did not, it’s probably worthwhile understanding why they didn’t click and then perhaps presenting the call to action in another email while acknowledging they “may” have had a chance to read the previous email. 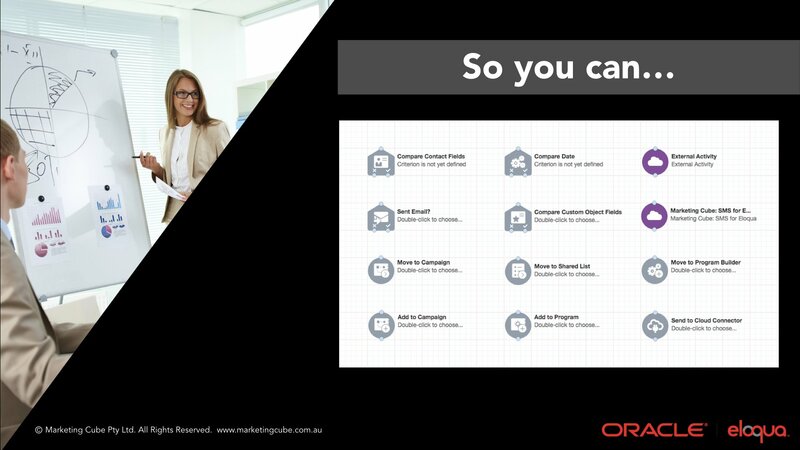 Taking advantage of the “Automation” in Marketing Automation is key to getting from Eloqua. A big part of this is the Campaign Canvas. The canvas provides you with a visual representation of how to design your customer’s experience. During the user group this month, we touched on “Shared Filters” and how they effectively allow you to ‘segment on the fly’. For example, you can use the “Visited Website?” decision step, however this only gives you a Yes or No outcome based on the contact having visited any Eloqua tracked website you own. If you want to ask the question, has a contact visited one of three specific web pages or Eloqua Landing Pages, you need to use a Shared Filter to do that. The only caveat with this point is that some care needs to be given to exactly what you automate. 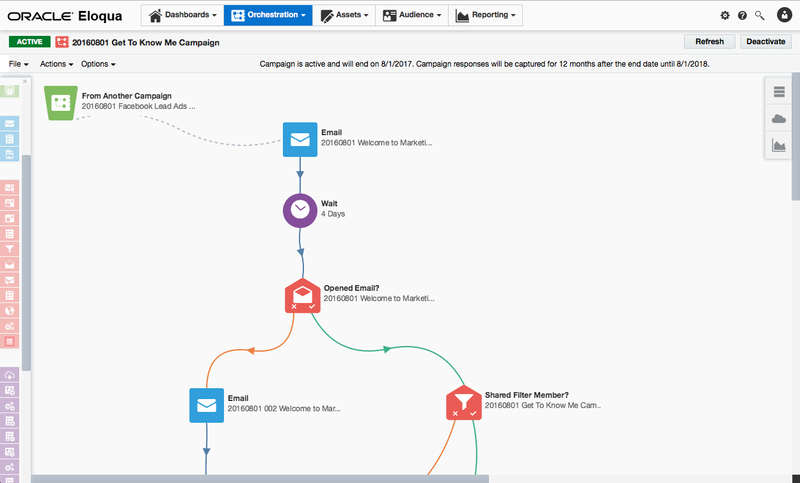 While many of the campaigns you run may be done in isolation, the key consideration with Marketing Automation is to ensure the campaign you’re about to launch makes sense in the context of a customer’s journey. When you understand the journey your prospects or customers take, it’s then critical to move them from one campaign to the next in a way that enhances their ability to understand the business problem your solve. Shared Filters is a bit like Segmenting ‘on the fly‘, so to speak. It allows you to apply any of the filters you’re familiar with from Segments to the campaign canvas while it is active. It’s especially helpful for campaigns that run over weeks or months where it’s likely the profile or behaviour of a contact will change compared to when you initially launched your campaign.